Torque is very important to people who are interested in buying a new car, especially people who are interested in larger pickup trucks and sport utility vehicles. Vehicles which are going to be used for towing large loads or climbing steep hills, torque is often more important than horsepower. Scientifically, torque is the moment of force along an axis. In automobiles with internal combustion engines, torque is related to the twisting force that is applied to the crankshaft. This force is caused by the pressure that is produced from a burning fuel mixture. The pressure sequentially forces each piston into its bore. The pistons revolve around the crankshaft, which powers the vehicle. This means that torque helps a car take off from a stop and pull weight up a hill. The torque rating determines how much force an automobile can apply to the road. 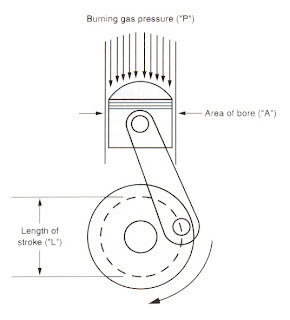 Torque is proportional to the stroke which describes the diameter of rotations around the crankshaft. The stroke depends on how far the connecting rod journal is offset from the centerline of the crankshaft. When the journal is farther from the centerline, the stroke is longer, which produces a greater torque. Racecars have a very short stroke which results in a large amount of horsepower at high RPMs, but a small amount of torque is generated by the engine. But the torque is not important to racecar drivers since they begin their races already in motion, so there is no taking off from a start. On the other hand, Diesel engines have a very long stroke, which is why most construction vehicles use a diesel engine. An engine reaches its peak torque range at different rpms. This can help a person choose the right car. For cars being used around town and on the highway at moderate speeds, they should have a peak torque range of 1800-2500 rpms. For more heavy duty work, such as towing and carrying heavy cargo, a peak torque range of 4000-5500 rpms would be more suitable.